(Aug. 3, 2015) – Vibrant sunflowers, tomatoes, peppers, herbs and more thrive alongside homemade bamboo trellises and watering hubs in an 86-plot garden. 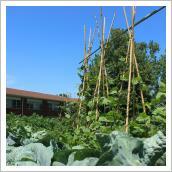 Corn stalks grow tall while cabbage blooms in a plot across the walkway. This is where Sookti Chaudhary, a doctoral student in the University of Kentucky Department of Economics, cultivates fresh foods and connects with others. 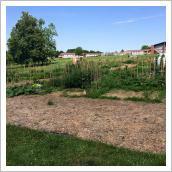 The garden is located right here on the UK campus in the Shawneetown graduate and family housing community. What began as a student initiative in 2009, the Shawneetown garden has grown from a space for 20 residents to now nearly 90 plots. But more than that, thanks to a UK Sustainability Challenge Grant (SCG), it has transformed into a sustainable community garden, generating physical, ecological and socio-cultural sustainability. "We used to grow our own vegetables when we were in Nepal," said Chaudhary, who lives with her husband at Shawneetown. "So we know how fresh ingredients can make a difference to our cooking. We loved the taste of freshly picked vegetables. But when we arrived in the U.S. last year, we were a little disappointed with the vegetables found in the supermarkets." So Chaudhary and her husband began growing fresh, healthy and flavorful organic vegetables in the Shawneetown garden. Renting three plots for $25 each for the entire growing season, they are currently growing tomatoes - cherry, beef steak and Krim tomatoes - as well as hot peppers, bell peppers, okra, bottle gourd, bush beans, lima beans, chard, collard and kale. And what would a meal with fresh vegetables be without fresh herbs? Thyme, oregano, parsley, mint and cilantro are also sprouting in Chaudhary's plots. This summer, the garden underwent an expansion allowing more residents to garden and a redesign with seating areas and walkways. Tool hubs were built and gardening supplies were provided to gardeners. Because the community houses graduate students and families, a children's area is also in the works. Chaudhary says the garden is now not only a stress reliever, but a place to socialize and connect. "It's now more convenient for us to move around and interact with others in the garden," she said. "We did not know of any Nepalese families until we started our garden…now we know more than five Nepalese families and several others from different countries." Indicative of the community of international residents living at Shawneetown, the garden blooms with foods from all over the world. "It has provided us with a sense of community," Chaudhary said. "It is a wonderful place for learning from others since everybody has different gardening skills. It is amazing to see how creative people could be with their plots." And that is exactly what project leads Helen Turner, assistant professor in the UK School of Interiors, and Krista Jacobsen, assistant professor in the UK College of Agriculture, Food and Environment's Department of Horticulture, were aiming for. Turner and Jacobsen, along with engineering student and Students Engaged in Agriculture Discovery (SEAD) President Michael Blum and interiors student and Interior Design Student Association (IDSA) President Alaina Bauer, teamed up to focus on design and sustainable horticulture. After receiving a $15,000 UK Sustainability Challenge Grant for their proposal, "Cultivating Place for a Sustainable Community: Revitalizing the Shawneetown Community Garden," in November 2014, the team wasted no time and soon incorporated the project into hands-on learning for other students. "This is one of the most interesting projects I've ever been a part of just because of the partnerships it has allowed and the impact it has had on this community," Turner said. "The program (UK Sustainability Challenge Grants) speaks a lot to the University of Kentucky and the value it places on sustainable movements." Drafting four different proposals, UK College of Design students designed the initial plans. In the spring semester, two of those students were involved in independent studies related to the garden's revitalization. Students in Jacobsen's Introduction to Sustainable Agriculture course and student organizations, such as SEAD and IDSA, also played a significant part in the project. And they were able to experience both sustainable agriculture from Jacobsen and design activism from Turner. "I think it's an interesting partnership between horticulture or sustainable ag and design because they sort of merge in terms of creating 'place'," Turner said. Pulling from both areas of expertise to create a sustainable environment in all meanings of the word, the team utilized recycled materials - like pallets donated by UK Physical Plant Division's Recycling Program to create wall planters and tool containers - and environmentally friendly fertilizer, as well as cardboard and wood chips as an alternative to weed barrier in some of the paths. 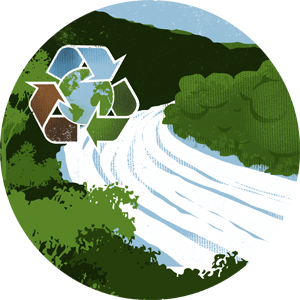 But a sustainable community is much more than the footprint it leaves on the environment. The Shawneetown garden is also sustainable in terms of residents, how they eat and the cultural significance, as it allows them to grow food that is not available here. "It's about the interaction of people and how they feel a part of something," Turner said. "Being a community garden, it's not just about a bunch of plots, but it could be a place where they come and they have a sense of community, where they have a sense of togetherness." In September, the team and gardeners will host a Garden to Table event, offering a taste of the fresh, seasonal foods grown there and a tour of the revamped garden. "'Cultivaiting Place' is one of seven interdisciplinary efforts funded by the first round of Sustainability Challenge Grants and it is a shining example of what we hoped to see from this program," said Shane Tedder, sustainability coordinator for the university. "It is interdisciplinary, has high level of student engagement, is transformative for our community and utilizes our physical campus as a living laboratory." Thanks to the success of this project and six others funded in the first year of the SCG program, the funding available through the program will double for the coming year from $100,000 to $200,000. A call for proposals will be released in mid-August 2015 with applications due in October. Funding support for the 2015-2016 SCG program provided by the Executive Vice President for Finance and Administration, the Provost, the Vice President for Research and the Student Sustainability Council.